More than three hundred and fifty of Terry Savoie‘s poems have been published in literary journals over the past four decades. These include APR, Poetry, Ploughshares, Black Warrior Review, Prairie Schooner, Great River Review, The Iowa Review and North American Review as well as recent or forthcoming issues of The American Journal of Poetry, America, The Cortland Review and Birmingham Poetry Review among others. A chapbook, Reading Sunday, recently was named the winner of the Bright Hills Competition and will be published later this year. Photographer’s Note: To me, this poem represents something deeper – a message to protect yourself. 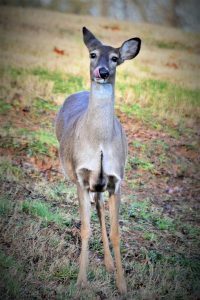 The photo of the sweet deer depicts the outward appearance of innocence with an underlying motive that could destroy your “garden” (your happiness, your soul, your inner peace). Always use kindness and beauty (flowers) and suppress your anger in a controlled manner (compost). It will do wonders toward protecting your character. And in the end, your “garden” will be nourished and thrive beautifully.